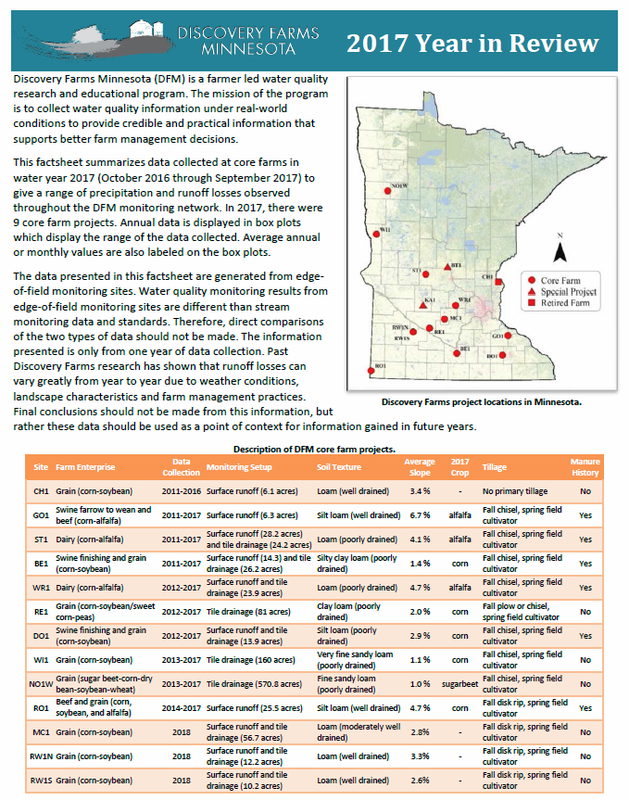 The Discovery Farms Minnesota 2017 Year in Review provides a summary of the data generated from 9 core farms with edge-of-field surface runoff and tile flow monitoring. The report is a general overview of the amount of precipitation, surface runoff, tile flow, and soil, phosphorus, and nitrogen loss measured throughout the Discovery Farms Minnesota monitoring network in water year 2017 (October 2016 through September 2017). Overall, precipitation in 2017 was near normal across Minnesota with the sites ranging from 3.60 below normal to 3.01 inches of precipitation above normal. Precipitation in 2017 can be characterized by near normal conditions until June, a dry June and July, and wet August. Surface runoff was lower and tile flow was similar in 2017 compared to past years. Average surface runoff in 2017 was 0.60 inches with a range from 0.11 to 1.09 inches. Across the DFM network, 52% of the annual surface runoff occurred during frozen soil conditions in January and February. Compared to past years there was more surface runoff than usual in October. Most of the surface runoff occurred in October, February, and May. Average tile flow was 5.37 inches with a range from 1.18 to 9.75 inches. Tile flow was relatively consistent from October through June with lower amounts in July, August, and September. For full details on data collected at Discovery Farms Minnesota project in water year 2017, please view the full report here.